IF YOU WANT AN EMAILED GIFT CERTIFICATE, YOU HAVE TO CALL IN AND REQUEST IT! 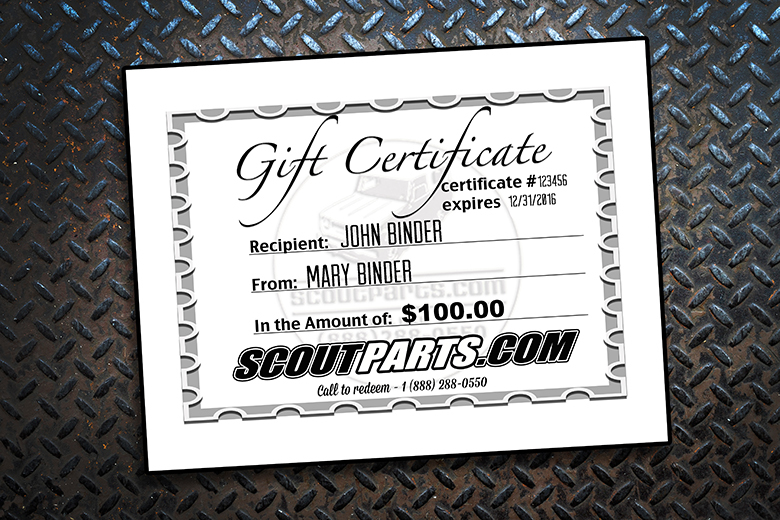 Scoutparts.com gift certificates are the perfect gift for any Scout enthusiast! We'll send a nice cardstock, official gift certificate with a "to and from". Let us know who you want them made out to and who it's from, and will include those names on front. When ordering, under "Vehicle Information" go to the comment section and type in "To: Mary Binder, From: John Binder" and we'll personalize your gift certificate! Please call to order a different amount than is offered here. Can be used at Scoutparts.com, Travelallparts.com or Farmallparts.com.